So, before I knew it November rolled around again. NaNoWriMo is something that I became aware of a few years ago listening to CraftLit. Listening I also learned about Shannon Okey’s NaKniSweMo in which knitters try to knit a sweater in one month. Two years ago I actually did it and knit Wendy Bernard’s Tang Sweater. Last year I tried again, to no avail. So, when October looked like it really was going to end, I started thinking about NaKniSweMo again. I had thought I would do Chicknits Mondo Cable Cardi. So I headed on over to my local yarn store, The Warm Ewe, and picked out some Berroco Ultra Alpaca. I had made Cutaway from this a few years ago, and loved the yarn. 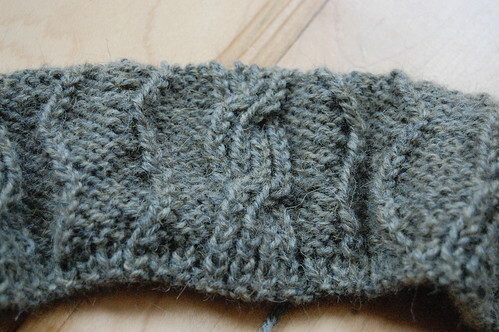 However, when I started swatching, it became pretty clear that this wasn’t the right yarn for me for this sweater. So I did a little research on Ravelry, and went back to Chic Knits to look at some other patterns. I’ve enjoyed Bonne Marie Burns’ patterns. My only frustrations with them have been my own fault (not reading the pattern, not being honest with myself about the right size), so I wanted to knit myself one that I would enjoy. I finished one earlier this year, but it just doesn’t fit, so I’m not sure what I’ll be doing with it. 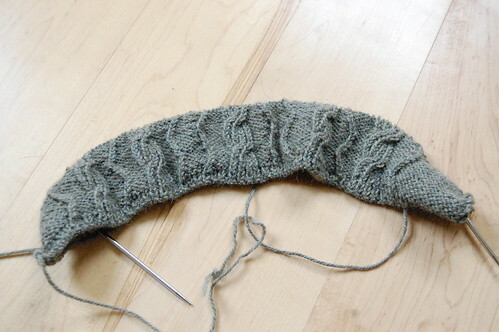 So, I’m not sure if it will be done in a month, but I am certainly having fun knitting it. Is anyone else doing NaKniSweMo? At least you have made some progress! And I love the color of the yarn that you selected… very pretty!